"As an experienced Bonefish angler I enjoy the space offered by the 2:1 guide to angler ratio. My first trip I employed the use of a private guide and did the 1:1 thing, but at this point in my life I enjoy spotting my own fish half the time. It's more rewarding for me that way." The Red's Fly Shop team will be sure that you are properly booked, prepared, and organized on what is the "trip of a lifetime" for many anglers. Using our service and a host is a great way to make your experience the best it can be. The great Lefty Kreh has described Christmas Island as "the best Bonefish fishing on the planet..." He would know! Come see for yourself. This is one of the most famous fly fishing destinations in the world and this is your chance to sign up for this trip with a host that is going to travel alongside you for the entire week. You book with us and fish with us! 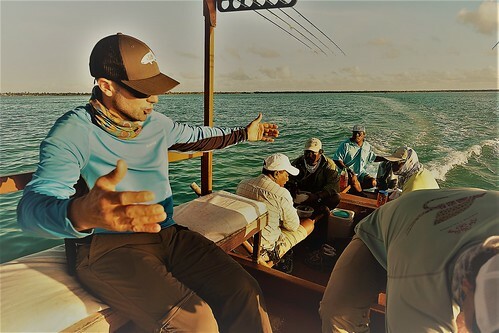 This is an amazing adventure where there are many species to target including world class Bonefish, Giant Trevally, Blue Fin Trevally, and about a dozen other species. Fly into Honolulu, Hawaii on Monday. Tuesday, fly to Christmas Island and check into the lodge Wednesday - Monday fish, fish, fish. Tuesday, transfer to the airport early in the morning, fly to Honolulu, fly home. Allow a minimum of 2 hours in Honolulu to clear customs. GT's are amazing fish, and catching a fast cruiser on the open flats that is spotted and sight cast to is a very special catch! You will never forget it. On our trips to The Villages we don't use chum to lure the fish in close, lodge policy. We work hard and try to catch these brutes "fair chase". Catch numbers of these beasts are not high and we want to keep expectations realistic for every angler that comes along. All anglers will get shots at big GT's while wading the flats. Not everyone will get one however. There are other lodges and other trips willing to chum them in, but this is not one of those trips. We tend to find that a "no chum" culture on our trips binds anglers together with shared values and everyone has a fun time. If and when an angler is fortunate enough to land a big GT we will all celebrate. If you don't get one, that is ok too! We have a tendency on our trips to celebrate pretty much everything. We simply encourage anglers to do it right and fish without chum. If you share these sentiments then this trip is for you. *Dates listed include travel days to/from Honolulu. Your return flight from CXI will be one day before your Honolulu arrival due to the Int'l Date Line.